Thrills Casino – Pay N Play plus 10% Cashback every week. The website is clean and crisp with a simple blue and white theme. Their yellow and black logo with lightning bolt stands out amidst this theme. The menu is easy to follow and broken up into the following: Top Games, New Games, Slots, Jackpots, Live Casino, Table Games, Classic Slots, Providers, All Games. Yes you read that correctly you can sear via the provider. And considering the number of providers they have it might be worth utilising this search parameter. 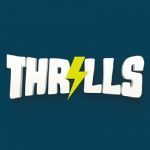 We would normally introduce the Welcome Offer here, in this review we are unable to do that as Thrills Casino doesn’t actually have a Welcome Offer, in fact they don’t really offer any promotions. Which is strange considering the market that they play in. However, you shouldn’t choose your online casino based solely upon the welcome offer. Keep reading to find out about the 10% cashback mentioned above. As mentioned Thrills Online Casino do not have Welcome Offers or Promotions as such. What they do offer is a cashback bonus of 10% EVERY Monday. It works like this: if you haven’t had any luck throughout the week, Thrills Casino will give you 10% back of your weekly loss. (Bets minus wins). Minimum is €1/10kr, maximum €1,000/10,000kr. This ‘bonus’ applies to all of their games. Like with all promotions/bonuses we recommend that you read and understand the terms and conditions. This promotion by Thrills is no exception. 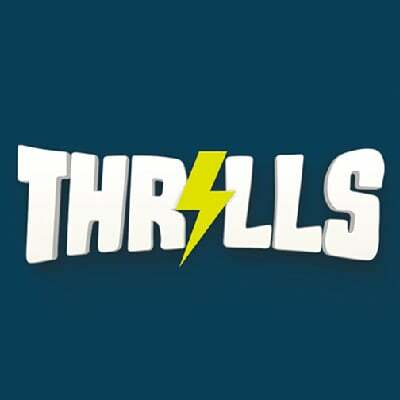 Here is the link for Thrills complete terms and conditions. We were a little disappointed at this based purely on the climate of the online casino market. However, like we mentioned you shouldn’t be choosing your online casino based purely on welcome offers, choosing an online casino that suits you should be based on a broad range of selection criteria including software developers, table limits, withdrawal and payment methods and times, and the casino’s reputation. Whilst Thrills doesn’t a welcome offer they do have a good reputation, a great selection of software developers and quick and no fuss payment and withdrawals. Sweden: Nordea, Swedbank, Sparbanken, Hendelsbanken, SEB, Länsförsäkringar, Skandiabanken, Danske Bank and Sparb. Syd. Finland: Nordea, OmaSp, OP, S-Pankki, Danske Bank, Säästöpankki, POP Pankki, Aktia, Ălandsbanken, Hendelsbanken. Germany: Thrills just require your IBAN, BLZ or bank name. Because Thrills Casino is linked to your bank account the deposit and withdrawal times are quick, sometimes less than 24 hours. The minimum deposit and withdrawal is €/$10. Thrills Casino have a large range of slots available, with every theme available. So there’s bound to be something here for everyone. From TV like the popular Vikings, movie themes like TED, Spinal Tap and DC Heroes. They also have themes such as music, fruits, legends & myths, dragons & fairy-tales and Gods & Goddesses. All of these can be played for fun, no need to deposit. On top of these themes Thrills Casino also have a great range of classic slots for those old-skool punters. They do have a good selection of jackpot slots as well including Divine Fortune, Mega Fortune, Fruit Bonanza and Speed Cash. All with their jackpots listed clearly for you to see, unfortunately you can’t ‘test’ these jackpot slots, meaning that you have to play with real money. This is the same across the industry so there’s no surprise here. Thrills Casino also have the usual suspects when it comes to their table game selection. Poker, Blackjack, Roulette, Baccarat, Casino Hold ‘em and Texas Hold ‘em are all available including some variants of these classic casino games. For example they have over ten variations of Blackjack. They offer both American and European Roulette. As for their poker they have the likes of Aces & Eights, Aces & Faces, Bonus Deuces Wild and Caribbean Stud available. What we found great about Thrills Casino is that they have low limit table games available. These are clearly marked in the table games lobby so there’s no need to go searching in and out of tables to find a limit that suits you if you are playing on a low budget. This shows that they understand the market and their customers. Their Live Casino has a strong selection of games as well. We found that they do have a focus on Blackjack, but then most online casino’s do have a ‘preferred’ game. The dealers are professional and like the table games there is a budget here for everyone. Whilst they do seem to focus on Blackjack they have a nice variety of Roulette tables here as well. It’s worth mentioning that unlike some online casinos you do need to deposit to view the tables. Thrills have a great mobile site. It’s set up much like their PC website and follow the same colour scheme. The sliding menu on the top has the categories of games exactly the same as their website. And the thumbnails are huge, if you forgot your glasses you’re in luck with Thrills Casino mobile app. Unfortunately one of the downsides to this app is the large number of restricted countries, which is going to hinder you if your phone is ‘registered’ with one of these one countries. Aside from that rather large point the whole mobile app runs like a dream. It’s as easy to navigate and user-friendly as the website and you can virtually access everything available on the website, from deposits to live chat. Thrills Casino have a brilliant support team. They are quick in their response, professional and knowledgeable. They unfortunately do not have a FAQ page, so any queries will have to be directed straight to their customer support team, which are available 24/7. Thrills Casino is a solid site. It’s easy to navigate and the Pay N Play really does set it apart from some of the other casino sites out there. They are partnered with a large selection of software developers leading us to believe that they have a good reputation with them. They have a strong selection of games available that compliments anyone’s budget. They also have a fantastic customer service team. With all this and their fast withdrawal process it’s an online casino worth checking out. The only thing that we really found disappointing was the large number of restricted countries. Over 90 countries are on the list, making it difficult for Thrills Casino to gain exposure. When we contacted the customer support they told us that Thrills Casino is only available to customers from Germany, Sweden and Finland. For such a great online casino with such a big name, BetIt, behind it we really struggled to understand why this potential heavyweight wasn’t a house-hold name.